TRACONs are considered terminal facilities because they provide the link between the departure airport and the en route structure of the NAS. Terminal airspace normally extends 30 nautical miles (NM) from the facility with a vertical extent of 10,000 feet; however, dimensions vary widely. Class B and Class C airspace dimensions are provided on aeronautical charts. 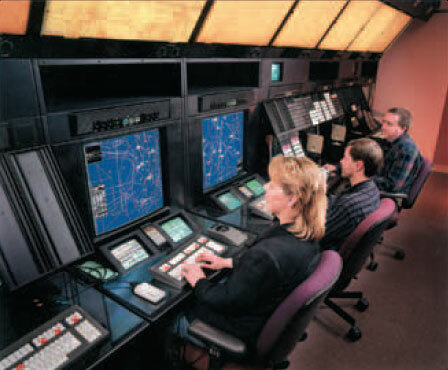 At terminal radar facilities, the airspace is divided into sectors, each with one or more controllers, and each sector is assigned a discrete radio frequency. All terminal facilities are approach controls and should be addressed as “Approach” except when directed to do otherwise (e.g., “Contact departure on 120.4.”). Figure 2-7. 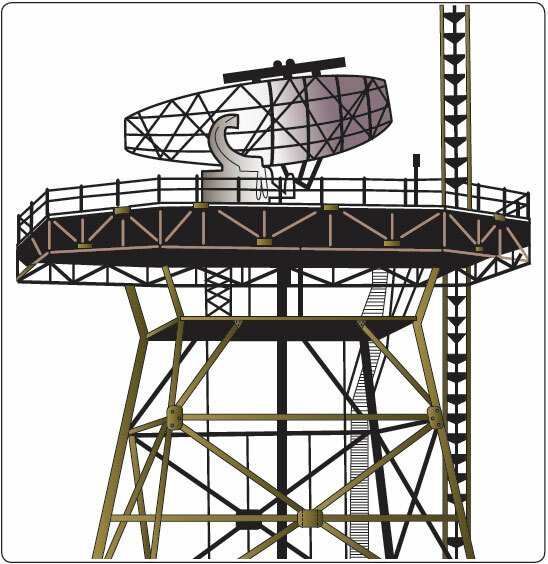 Combined radar and beacon antenna. Terminal radar antennas are located on or adjacent to the airport. Figure 2-7 shows a typical configuration. Terminal controllers can assign altitudes lower than published procedural altitudes called minimum vectoring altitudes (MVAs). These altitudes are not published or accessible to pilots, but are displayed at the controller’s position. [Figure 2-8] However, when pilots are assigned an altitude that seems to be too low, they should query the controller before descending. Figure 2-8. Minimum vectoring altitude (MVA) chart. When a pilot accepts a clearance and reports ready for takeoff, a controller in the tower contacts the TRACON for a release. An aircraft is not cleared for takeoff until the departure controller can fit the flight into the departure flow. A pilot may have to hold for release. When takeoff clearance is received, the departure controller is aware of the flight and is waiting for a call. All of the information the controller needs is on the departure strip or the computer screen; there is no need to repeat any portion of the clearance to that controller. Simply establish contact with the facility when instructed to do so by the tower controller. The terminal facility computer picks up the transponder and initiates tracking as soon as it detects the assigned code. For this reason, the transponder should remain on standby until takeoff clearance has been received. The aircraft appears on the controller’s radar display as a target with an associated data block that moves as the aircraft moves through the airspace. The data block includes aircraft identification, aircraft type, altitude, and airspeed. At facilities with ASR-3 equipment, radar returns from precipitation are not displayed as varying levels of intensity, and controllers must rely on pilot reports and experience to provide weather avoidance information. With ASR-9 equipment, the controller can select up to six levels of intensity. Light precipitation does not require avoidance tactics but precipitation levels of moderate, heavy, or extreme should cause pilots to plan accordingly. Along with precipitation, the pilot must additionally consider the temperature, which if between –20° and +5 °C causes icing even during light precipitation. The returns from higher levels of intensity may obscure aircraft data blocks, and controllers may select the higher levels only on pilot request. When uncertainty exists about the weather ahead, ask the controller if the facility can display intensity levels—pilots of small aircraft should avoid intensity levels 3 or higher. At many locations, instrument flights can be conducted entirely in terminal airspace. These tower en route control (TEC) routes are generally for aircraft operating below 10,000 feet, and they can be found in the A/FD. Pilots desiring to use TEC should include that designation in the remarks section of the flight plan. A valuable service provided by the automated radar equipment at terminal radar facilities is the Minimum Safe Altitude Warnings (MSAW). This equipment predicts an aircraft’s position in 2 minutes based on present path of flight—the controller issues a safety alert if the projected path encounters terrain or an obstruction. An unusually rapid descent rate on a nonprecision approach can trigger such an alert. Figure 2-11. Center radar displays. Earlier Center radars display weather as an area of slashes (light precipitation) and Hs (moderate rainfall), as illustrated in Figure 2-12. Because the controller cannot detect higher levels of precipitation, pilots should be wary of areas showing moderate rainfall. Newer radar displays show weather as three levels of blue. Controllers can select the level of weather to be displayed. Weather displays of higher levels of intensity can make it difficult for controllers to see aircraft data blocks, so pilots should not expect ATC to keep weather displayed continuously. Figure 2-12. A center controller’s scope. Center airspace is divided into sectors in the same manner as terminal airspace; additionally, most Center airspace is divided by altitudes into high and low sectors. Each sector has a dedicated team of controllers and a selection of radio frequencies because each Center has a network of remote transmitter/receiver sites. All Center frequencies can be found in the back of the A/FD in the format shown in Figure 2-13; they are also found on en route charts. Figure 2-13. 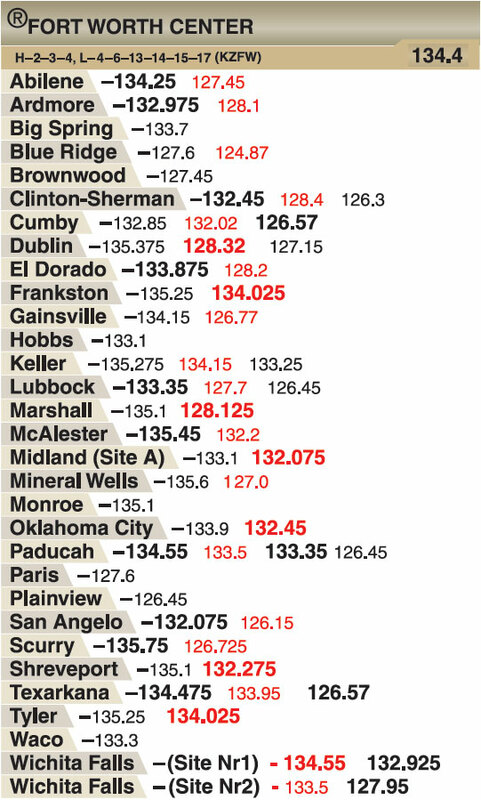 A/FD center frequencies listing. Each ARTCC’s area of responsibility covers several states; when flying from the vicinity of one remote communication site toward another, expect to hear the same controller on different frequencies. 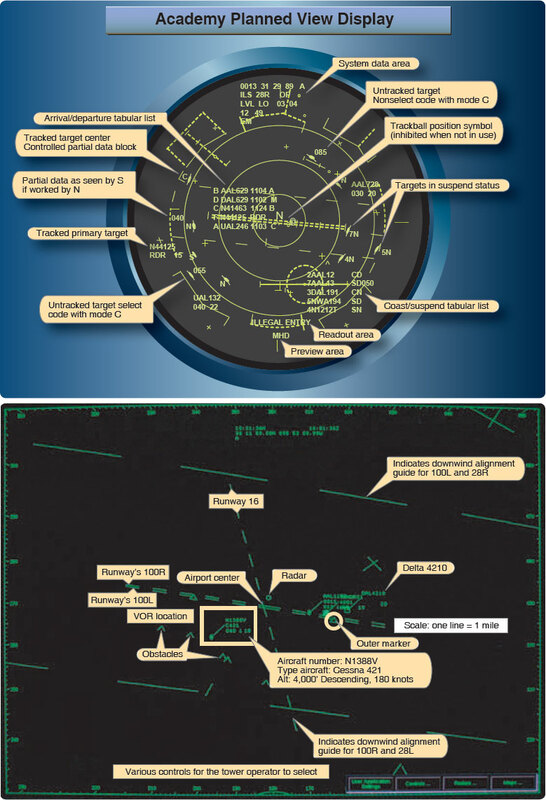 The majority of airports with instrument approaches do not lie within terminal radar airspace and, when operating to or from these airports, pilots communicate directly with the Center controller. Departing from a tower-controlled airport, the tower controller provides instructions for contacting the appropriate Center controller. 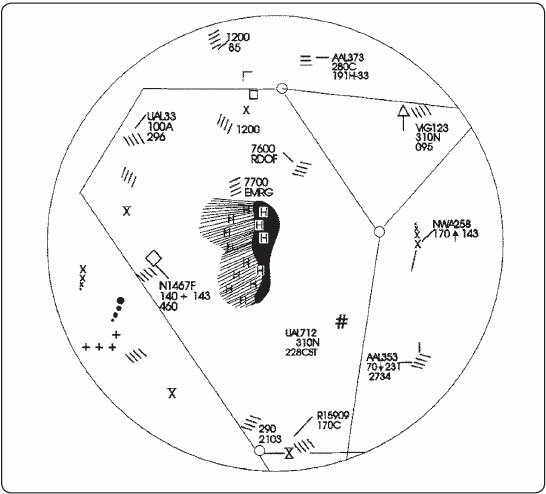 When departing an airport without an operating control tower, the clearance includes instructions such as “Upon entering controlled airspace, contact Houston Center on 126.5.” Pilots are responsible for terrain clearance until reaching the controller’s MVA. Simply hearing “Radar contact” does not relieve a pilot of this responsibility. If obstacles in the departure path require a steeper-than-standard climb gradient (200 feet per nautical mile (FPNM)), then the controller advises the pilot. However, it is the pilot’s responsibility to check the departure airport listing in the A/FD to determine if there are trees or wires in the departure path. When in doubt, ask the controller for the required climb gradient. 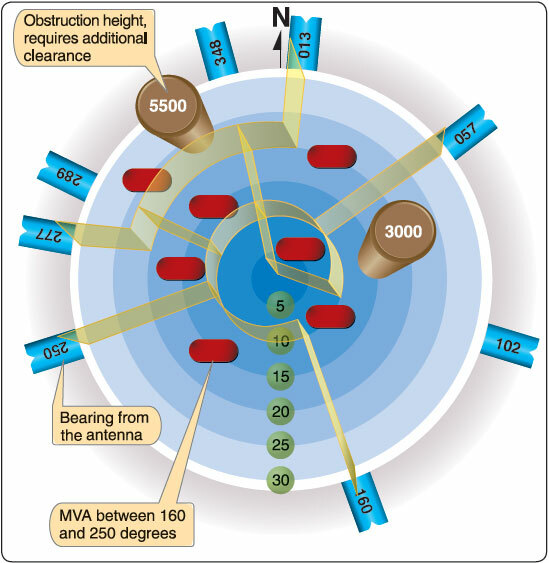 A common clearance in these situations is “When able, proceed direct to the Astoria VOR…” The words “when able” mean to proceed to the waypoint, intersection, or NAVAID when the pilot is able to navigate directly to that point using onboard available systems providing proper guidance, usable signal, etc. If provided such guidance while flying VFR, the pilot remains responsible for terrain and obstacle clearance. Using the standard climb gradient, an aircraft is 2 miles from the departure end of the runway before it is safe to turn (400 feet above ground level (AGL)). When a Center controller issues a heading, a direct route, or says “direct when able,” the controller becomes responsible for terrain and obstruction clearance. Another common Center clearance is “Leaving (altitude) fly (heading) or proceed direct when able.” This keeps the terrain/obstruction clearance responsibility in the flight deck until above the minimum IFR altitude. A controller cannot issue an IFR clearance until an aircraft is above the minimum IFR altitude unless it is able to climb in VFR conditions. On a Center controller’s scope, 1 NM is about 1⁄28 of an inch. When a Center controller is providing Approach/Departure control services at an airport many miles from the radar antenna, estimating headings and distances is very difficult. Controllers providing vectors to final must set the range on their scopes to not more than 125 NM to provide the greatest possible accuracy for intercept headings. Accordingly, at locations more distant from a Center radar antenna, pilots should expect a minimum of vectoring.